Mark Feasel of Schneider Electric looks at the Port of Long Beach in California as a model for how we can modernize infrastructure. Despite its position as a world power, the US infrastructure ranks behind that of most other advanced nations. Today, the US spends less on infrastructure as a percentage of GDP than at any time in the past twenty years – at a time when our infrastructure is in greatest need. Public financing methods are insufficient to maintain and grow the infrastructure required to support our modern digital economy. At the same time, fiscal constraints and restrictive tax laws have made it difficult to fund infrastructure improvements, putting critical infrastructure such as airports, seaports and municipal services at risk. And make no mistake, our infrastructure is at risk. 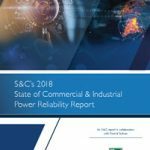 Its fragility was starkly evident in 2017 and again in 2018 when severe weather disrupted power grids and critical infrastructure across the country, costing billions in damages and lost business. With the frequency and severity of such events increasing, infrastructure owners and operators are looking for new ways to fund and modernize their infrastructure. Modernizing U.S. infrastructure is a costly undertaking. Considering the exhausted state of many of these energy assets, the challenge to make them more sustainable and resilient is daunting, to say the least. But modernization doesn’t always necessitate building all new assets. In many cases, existing energy assets are sound, but underutilized. The key to unlocking better utilization of existing assets is digitization. There is enormous untapped potential in our existing infrastructure. By digitizing these assets, we can unleash valuable data and productivity. Through IoT-enabled solutions that overlay intelligence on the existing assets, operators can get so much more out of their infrastructure. Using sensors, they can more precisely understand its condition, while machine learning can better predict its performance, and controls and automation can be used to affect its operation and maintenance. Not surprisingly, widespread power loss during and after recent damaging storms has driven increased interest in advanced microgrids that can island from the power grid to prevent power loss in crisis situations. One such example is California’s Port of Long Beach – also known as the second-busiest container port in the U.S. Based on its need to retain its high level of activity, in 2015, Port of Long Beach undertook a project to create a more resilient ecosystem, support cargo operations, and supply power to vital city services in the event of an outage, independent of the grid. Schneider Electric contributed four significant elements of modernization: electrification, connectivity, safety and automation. Automating its largest terminal gave Port of Long Beach the ability to operate cranes, oversee truck deliveries, monitor the weighing of cargo, and much more via software. This contributed significantly to safe port operations enabling personnel to operate cranes remotely in bad weather. Infrastructure owners and operators seeking to leverage modern technologies are turning to alternative financing models to fund new energy solutions. Electrification of the port means ships now have abundant power while docked, eliminating reliance on less sustainable shipboard power plants to serve load during the docking period. Automation and electrification contribute enhanced connectivity and the ability for port managers to gain a holistic view of cargoes, ships, people and vehicle movements across the port – an essential component to a 21st century infrastructure facility. Modernization has also benefited the port and the city by creating greener and more sustainable energy. Digitization is the key to creating sustainable infrastructure. Five years ago resilience was at the expense of sustainability; now it’s at the heart of it. Infrastructure owners and operators seeking to leverage modern technologies are turning to alternative financing models to fund new energy solutions. The Energy-as-a-Service model (EaaS), in which a third-party finances the upfront capital for the project, is a proven way to make energy transformation feasible. The EaaS model eliminates one of the biggest hurdles to microgrid infrastructure and allows the customer to pay for the energy they need. An EaaS business model delivers predictable costs, resilience and sustainability, while a partner handles the complexity and risk of owning and optimizing a microgrid. In conjunction with industry players such as Dynamic Energy Networks (backed by The Carlyle Group), Schneider Electric offers Energy-as-a-Service, such as discrete energy infrastructure systems that can operate either in connection with or independent of the utility grid for a customer. With the tremendous advantage of this model behind us, we are bringing our experience and innovative solutions to bear in several upcoming projects. Innovative partnerships will drive new approaches and deeper collaboration to support modernized infrastructure for airports, seaports, and industrials. Innovations in energy technology and financing are bringing new opportunities to infrastructure owners and operators, enabling them to provide long-term value to the communities they serve. Digitizing energy infrastructure can unlock better resilience and sustainability, and more predictable costs. When leveraged in conjunction with alternative funding models, such as energy as a service, digitization and microgrid can provide the energy needed to modernize US infrastructure.